An Iranian pastor has just paid a high price for refusing to obey official orders about how he should run his church – he’s been given a ten-year jail sentence! Almost a month after his hearing, Pastor Victor Bet Tamraz has learnt he’s been declared guilty of ‘evangelism’, among other charges. Two Christians on trial with him – Amin Afshar Naderi and Hadi Asgari – also face long prison sentences, on charges which included ‘acting against national security’. Please pray that God’s peace will fall afresh on Pastor Victor, Amin and Hadi. The three men appeared in court on June 11 – two-and-a-half years after Victor and Amin were arrested at Pastor Victor’s house in Tehran province on Boxing Day 2014. 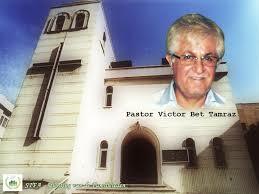 Hadi was arrested last August at a picnic in Firuzkuh, along with Pastor Victor’s son Ramiel. Judge Ahmadpour has now sentenced Victor to ten years’ imprisonment, Amin to 15 years and Hadi to ten years plus a two-year travel ban. They plan to appeal. In a further blow, Pastor Victor’s wife, Shamiran Issavi, has now been charged with ‘participating in foreign seminars’ and ‘acting against national security’. Both she and her son Ramiel are released on bail and are now awaiting trial. Please ask God to reassure these men of His plans and purposes for their lives–Pastor Victor, Amin and Hadi (Jeremiah 29:11). Pray their appeal will be swift and successful. Pray that all charges will be dropped against Shamiran, Ramiel and two other Christians arrested at the same Firuzkuh picnic: Mohamad Dehnay and Amir Sina Dashti. Pray for our entire Christian family in Iran, who will be shaken by Judge Ahmadpour’s verdict: pray they will stand firm in their faith and put their trust in God. Pray that Judge Ahmadpour will recognise that Iran’s Christians want to build up their nation, not ‘threaten its security’.